When we think of a car being wrecked so badly that it’s effectively totaled, we tend to imagine pretty gruesome, mangled wrecks. What we don’t usually picture is an incident that left damage so small you could hide it with your thumb, but that’s exactly what happened to one deeply unlucky Corvette. On July 19, my wife and I were in the middle of northbound late in heavy traffic heading back from Des Moines on I-35 by Ankeny, IA. The vehicle in front of us had cleared an object that was lying in the middle of my lane. I couldn’t avoid it or stop without causing what would probably be serious accidents for multiple vehicles. I had no choice other than to go over it, hoping it was small enough to go under the car. We aren’t sure what it was, maybe a rock, maybe a chunk of steel, but whatever it was, it was HARD. It barely nicked one of the alignment adjustment cams, then went on to dent the aluminum stiffening panel that also protects the exhaust and torque tube, bending three bolts on the panel and broke the head off one. Further back it dented a shield for the driver’s side gas tank and then hit a part of the frame. At least it missed the oil cooler. I had it inspected at Karl Chevrolet the next day and from a quick look, there didn’t seem to be any serious damage. We took it in to Karl’s for repair a few weeks later and we were told the frame strike caused a small crack, less than an inch and a half long and they were having difficulty finding a replacement part. A few days later, the shop told us the part is not available from Chevrolet and the car would be totaled. That led to a week and a half of calls with the insurance company who disputed what we were told as they thought that a part may be available or that the crack could be welded. We couldn’t get them to answer our question about who would warranty the car when welding apart that was labeled as unavailable from Chevrolet. Chevrolet indicated replacing it would compromise the structural integrity of the car. The insurance company finally came to the same conclusion on the frame part being unavailable, and declared it a total loss. We were surprised that after all of this, they gave us a fair offer and had a check to us for the car the very next day. So, to sum up, guy’s driving his Corvette on the highway, runs over some debris in the road, and thanks to the fate and her miserable, cruel sense of humor, that hard lump of whatever in the road managed to hit, with almost surgical precision, one of the points of the car’s underbelly that, if damaged, effectively compromises the car’s entire frame and is essentially impossible to fix, at least while keeping the car’s warranty. The actual damage consisted of a crack, a bit over an inch long, on the part of the frame known as the rear transmission tunnel. It seems insane that one little crack like that could compromise an entire car, but car frames are under a great deal of stress, and assessing damage like this isn’t always intuitive. Then again, this all seems sort of insane if you think about how many cars on the road in the Northeast and Midwest have frames made of the finest, flakiest rust that water and road salt can provide. While it certainly seems like the frame could be welded and repaired by a skilled aluminum welder, even if the repair is perfect, Chevrolet will refuse to warranty the car, according to the owner, who investigated repair solutions. I also can’t help but wonder what would have happened if the tiny crack wasn’t found at all? It’s not clear if this little crack would have caused any sort of catastrophic failure or not; I’m not sure anyone can say for sure. For those of you convinced you can repair the car and put it back on the road, here’s your chance. The car is up for auction, and the auction site lists the repair costs at about $7600. 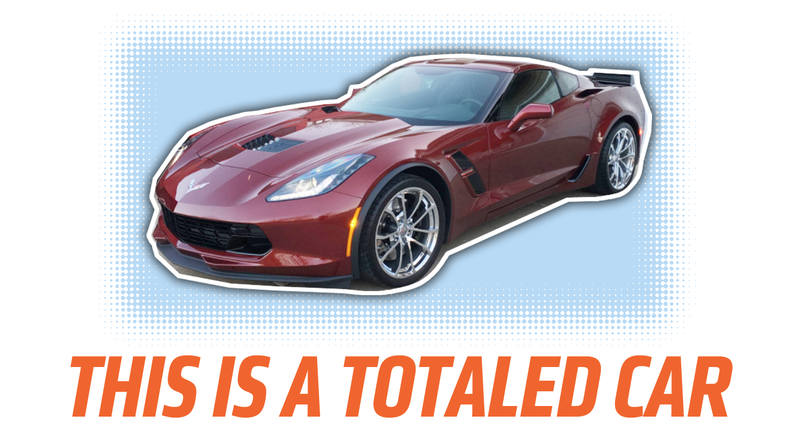 So, if you’re not a stickler for warranties, have the ability to weld aluminum or have the ability to forget about potential problems, this ‘Vette could be a sweet deal for you!